The old British state is crumbling. By James Gillray, 1793 - Library of Congress, Prints & Photographs Division. 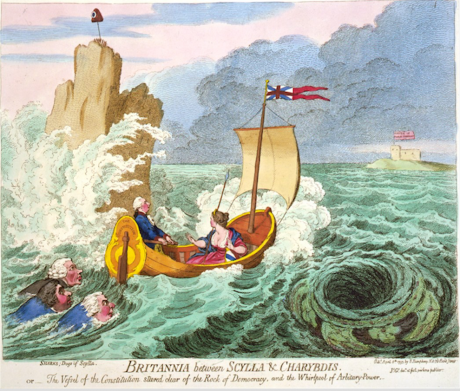 The Tory conference tried to sail on as if the sea wasn’t turbulent and choppy, with the ship heading for the rocks. Tory statecraft, élan, even class confidence, have all contributed to this – along with the vindication of the long held faith and religious zeal of those of a Brexit disposition. Many have come late to the latter, while Theresa May has embraced this dogma with the passion of the new found convert. You don’t have to look very far from the Tory bubble to find a very different mood and Britain. The pound at a 31 year old low, economic and financial jitters, Renault-Nissan warning about future investment in North East England, and wider business decisions being mothballed. Tory chutzpah won’t be enough this time for the Theresa May land grab on UKIP and Labour territory. There is a new populism in town, alert to the concerns which produced the Brexit vote, but one which attempts to promise certainty, stability and security in a world of uncertainty – part of which was created by the Brexit vote. Traditional Tory unionism – as articulated by Disraeli, Churchill and Macmillan – had an innate understanding of the patchwork nature of the United Kingdom. It had its blind spots (Ireland obviously) along with its elitism, patrician qualities, and limited democracy, but it told a story of working class incorporation into citizenship and institutions that had a popular resonance. That Tory story of Britain was a nationalism – a quiet, self-confident, self-assured nationalism of an elite which knew its place, power and importance – that has withered now to a faint echo. Its age is really that of a Britain of the past – pre-Heath, pre-Thatcher – irrespective of the continual, but empty, referencing of it by every Tory leader before and since. Theresa May is trying to invoke this tradition but it is threadbare, lacking a popular touch, and ill-equipped for modern Britain. Unionism is a form of British state nationalism, and a nationalism without the sure touch of a union vision is even more obviously nationalist. The discovery that Tories are British nationalists, unambiguous in rhetoric like ‘British jobs for British workers’, came as a shock to The Spectator’s Alex Massie, who finally woke up and realised that he was living under an apologetic ‘new nationalist government’. He always has been. Something profound has shifted in this nationalism. It has become an expression of a defiant, out and proud ‘little Britain’ which can now be seen in every walk of life – from politics, to media, and public life. This is explicitly no longer in most respects a British nationalism, but an English nationalism. And the future of British politics will turn out to be determined by the different expressions, forces and dynamics within that nationalism. There is a forgetful English nationalism – which has a collective amnesia about the nations and regions of the UK and which is driven by the insider class and elites. The other is a populist, vengeful English nationalism which utilizes feelings of hurt, loss, anger and betrayal – and which could turn into something much more poisonous and nasty than we have seen so far. The first sits at ease within the mainstream of the Tory coalition and establishment, and taps into the absent mindedness and forgetfulness which always characterises power and elites in Britain. This has showcased its ad-hoc nature and pragmatism, and was evident in how the UK gained and then lost an Empire. But the second is inarguably the much more potent, powerful force – evident in the Brexit vote, UKIP’s near four million votes in 2015, and the Corbyn revolution. And in a different context, such dismay and discontent gave force to the powerful coalition which nearly won the 2014 Scottish indyref. In an age of disruption and anger, Scotland’s ascendant SNP might seem an anomaly. So far they have managed to ride the twin horses of incumbents and insurgents, first, under the populist Alex Salmond, and now under the popular Nicola Sturgeon. The SNP government are playing a canny, waiting game waiting for the UK government to play its cards on Brexit before it decides to act and make a decision at some point on the possibilities for indyref2. Yet, pressures and constraints are evident in the SNP – in office for what will be coming up for ten years in 2017 – a political timescale that normally exhausts sitting governments – and by which point Thatcher and Blair were heading out their respective doors. The SNP is not immune to the laws of political dynamics and is fast becoming a new class and establishment vehicle, while Sturgeon’s many qualities may play well on Brexit, but now seem less well-suited for a substantive domestic policy agenda. That may seem too harsh, but as she comes up for two years as Scotland’s first minister her domestic legislative and policy record and programme seems thin. And at some point in the future that lack of substance will eventually matter. Politics is always about more than symbols. In bygone days, at least in the mythological version of British constitutionalism, the multiple crises of government and what passes for democracy would be met by a whirlwind of establishment initiatives, many, if not all of which, would be holding operations or mere window dressing. This would then be presented as enlightened elite rule and as good old-fashioned British compromise. Now the crises are so deep, and the rot in the system so profound, that such time honoured ways no longer suffice. It is also that the mythology is just that: the mumbo-jumbo and superstitions that have been invented and forged to keep the British state show going. Thus, prime exhibit number one here has been the fetishizing of parliamentary sovereignty – something invented to give the whole project meaning and coherence, and yet without any real legal meaning, and shorn of any even passing semblance of relevance since the UK entered the then EEC in 1973 (and subsequently limited further by Labour’s half-complete constitutional reforms from devolution to the Supreme Court). Absolute sovereignty as a mantra has played a significant part in two of the most brutal humiliations of Britain’s establishment in its history – the loss of the American colonies and Ireland. The debacle of Brexit and the near-loss of Scotland – the last of which has now been put back into play – can be seen as equally historic and disastrous to the prestige and power of the UK and for similar reasons; hoist on the wreckage of the shibboleth of sovereignty. Several powerful forces are heading for an almighty collusion. A Tory Brexit is emboldening a Tory party which thinks it can win absolute power with 24% of the electorate and then jettison large parts of the Cameron-Osborne agenda and head off in the opposite direction. The May moment is truly making a drama out of a crisis and ruthlessly using it to fashion a new politics claimed as ‘the centre ground’ – but which is equal parts Thatcherite, Blairite, Farage and Daily Mail with a dash of Ed Miliband’s concerns about predatory capitalism for good measure. That’s a remarkably Big Tent in aspiration and rhetoric, but it disguises how thin and narrow Tory England really is. Faultlines abound. British politics for one no longer exist as a national entity, campaign and set of debates. This was evident in the 2015 UK election, but it carries huge consequences when Westminster still claims its supreme place and power in national life, and the Tories swagger, walk and talk and claim their unrepresentative tribe as the one true national party and voice. Scotland has already left the building that is Britain, and Northern Ireland has placed itself in some kind of limbo. Unionism as we used to know it is dead. It was of its age: benign, supposedly wise, but deeply problematic, championed by anti-democratic forces who we were meant to trust and respect and leave to get on with the big decisions. A naked British or English nationalism, or indeed, more benign Scottish, Welsh or Irish minority nationalisms, do not provide any kind of adequate road maps for Britain or their respective countries. For all the plaudits the leader of the Scottish Tories Ruth Davidson gets there is very little behind her and very little strategy, and it is even beyond her to single-handedly reinvent a political tradition in terminal decline; providing a tactical, populist opposition to the SNP may prove to be a different thing. Equally, the Tory and Labour tribal accounts of Britain, whether in their traditional garbs or more recent modernisation versions, or the Corbyn revival show, have shown themselves to be inadequate for the times and crises we live in. What then comes after Thatcherism, New Labour and the battering of social democracy? What set of common values and over-arching political values and philosophies can we find to reassert some humanity, decency and public good across these isles after three decades of vandalism and asset-stripping? Even to ask the question is to illustrate the scale of the task, but the multiple crises we face: economic, social, cultural, democratic and geo-political, to name the most obvious, mean that the establishment order of Britain, old and new, has been revealed transparently as rotten, deformed and inadequate. All of Britain’s political elites have been tainted and tarnished by it, and somehow, Brexit and the reconfiguration of the relations of the peoples’ and nations of these isles, has to involve finding new collective voices and vessels. The Empire State Britain – which ran this country for so long and gave us the welfare state, Thatcherism and New Labour via its lack of democracy and ‘we know bestism’ – while clinging on to the illusions of Great British Powerism, is slowly but brutally coming to an end. Politics from now on will be much more bumpy, unpredictable and messy, and while there will be many difficulties to come, there is a profound opening and opportunity for ultimately, a much better politics and society. The road ahead will undoubtedly be filled with hazards, but at least there will be no false illusion that the British state can be reformed or used to bring about enlightened progress. The end of Empire State Britain isn’t just the end of that version of Britain, but the UK as we have known it, and potentially the UK as a state. Huge questions face us about whether an emasculated, discredited political class can navigate its way out of this mess of their own making to a new constitutional and political settlement – which in all likelihood will be a post-British one.